Comment: It starts with the typical Macallan balance, this is fab. 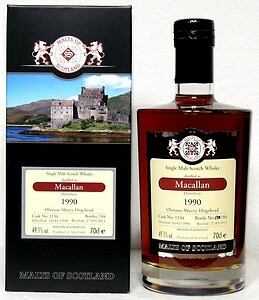 I find this dram to be quite typical in other aspects too: We got a decent sweetness (from malt and a little from the sherry), crystallized oranges, cherry jam in chocolate-covered gingerbread (Christmas hearts), apple kirsch liqueur, ripe plums, apples, tobacco and a hint of smoke from earthy peat. All these aromas appear in good Macs regularly. In addition to that there are black pepper elements and caramelized lemon skins with a chemical touch. The palate is very smooth despite 51,5% abv. Great balance again and pretty similar to its nose with discrete oakiness. Water isn’t necessary but doesn’t hurt the dram either, but I couldn’t find improvement – so better leave it. The finish is lovely and long, full of gingerbread, cherry pie, sweet malt, chocolate and Fino sherry. What’s not to like here? But never forget, taste is personal.